So far I've got this cover done. The whole cover layout is adhered to a 5x7 piece of chipboard. 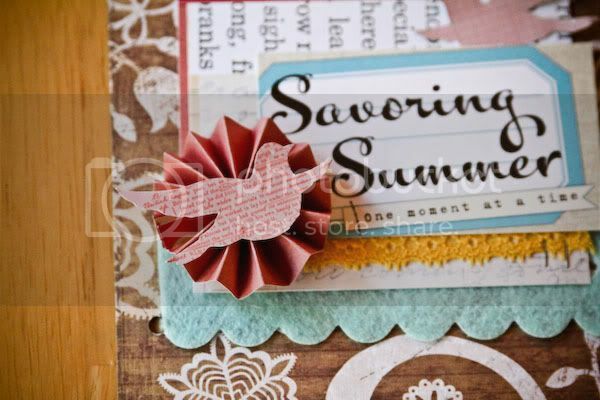 I love the accordion flower and the birdie I cut out from a piece of scrapbook paper. My journey back into paper scrapping is through mini-albums. After doing digital layouts for 4 years, I don't know if I can bring myself to do paper 12x12 pages. The canvas seems so BIG to me. AND you use so much supplies to fill up a 12x12 page. I just have so much anxiety about gluing things down on such a large scale. But mini-albums I totally dig! Mistakes are okay. The page is smaller and you didn't use up a whole bunch of supplies. Just start over. The smaller scale takes the pressure off of making a "perfect" page. Can use the smaller scale to experiment with techniques. Less supplies fit on a smaller page, so I don't feel like I have to put everything on there. There's a beginning and an end, because it's a themed project. The smaller scale means you get a page done more quickly and feel accomplished. I have found a bunch of mini-album inspiration, so I'll share them with you here. Evalicious mini art journals - when I saw her "Destination" mini art journal on Ali Edwards blog, I fell in love with paper scrapping all over again. This was in mid-April and I knew I just had to have this "Destination" mini art journal for a trip later this year, so I purchased it. When it came, I lovingly touched all the papers, ribbons, and embellies and fell in love with the idea of scrapping mini-albums, and paper scrapping again. She really puts GREAT mini's together and all you gotta do is add your photos and journaling. AWESOME! And buying something like this directly from her, when she lovingly crafted this kit together, is like finding a treasure to me. And supporting a woman's small business. :) Thank you Eve for making paper scrapbooking feel accessible to me again! Amy Tangerine's travel mini-albums - seriously totally awesome. I can't wait to take my scrapbooking supplies on vacation and scrap things as I go! Totally inspiring and fun! Her Hawaii album is here, and her San Diego album is here. Jenni Hufford's New Zealand travel album here and here - totally cute and she did such a great job talking about supplies to take as well. Ali Edwards has a whole section on her site devoted to mini-books. I love the inspiration I got from her "I Love You Today Because" mini-book, and her Collection of Love MiniBook Ideas. Elise Blaha also has a summer mini-book on sale in her Etsy store. She has been sharing her own Summer book progress on her blog, even with videos. Love this. If I hadn't already bought Elle's Studio's project kit, I would get this one. She also also shared a holiday mini-book that I would totally like to do this year. She has a huge section of mini-books that she's done on her site. That's it today about my love of mini-books! Happy Thursday! The selection of mini-albums you posted are simply inspiring. It has been really hard going back to 12x12 and mini stuff, especially when I screw something up. However, it has been satisfying my inner craving for real paper. I love your cover to your mini-book. Please keep us posted.